To schedule an appointment, please contact our office by phone or complete the request form below. We will contact you to confirm and review the details of your appointment. We are located in Uptown Whittier at the corner of Hadley Street and Washington Avenue. 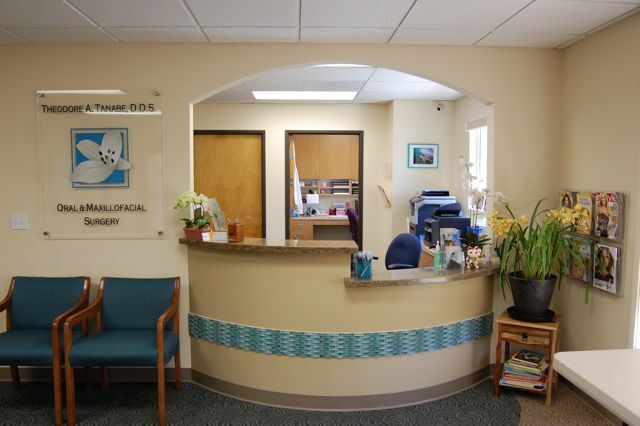 We are excited to welcome you to our newly renovated patient-friendly surgery office. Please note that for patients requiring complex surgical procedures, Dr. Tanabe highly recommends that you visit us for a consultation appointment prior to scheduling your surgery. And please understand that in some cases Dr. Tanabe may need to consult with a patient's physician or dentist prior to scheduling treatment. If you prefer to complete the Patient Information and Medical History forms in the comfort of your own home prior to your visit, please fill out and print those forms HERE and bring them to our office on the day of your appointment. Please do not use this page to cancel or change an existing appointment. We request that you call us at (562) 698-0387 instead.